2 August 2017 Unlocked content from the archive. 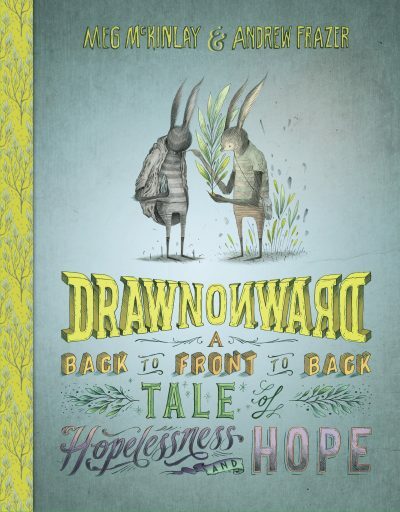 Drawn Onward is a clever picture book for older children that explores the transformative power of perspective. Author Meg McKinlay has crafted a palindrome that will delight observant young readers with the way that subtle shifts in language can flip a situation on its head. The first half of this book sees a character progressively sinking under the weight of negative commentary from a gloomy, apparently omniscient narrator—visualised in intricate detail by first-time illustrator Andrew Frazer. The second half sees the same character transform as the narrator, now slightly altered, shifts the meaning of the original wording. Frazer mirrors this metamorphosis with his use of colour and small creative touches. His style is decorative and distinctive, and the typography is as much an artwork as the illustrations. Deceptively simple, this book is suited to sensitive readers aged 10 and up who are entering that tricky adolescence period. Children of this age are likely to encounter some strong emotions, and this book is a good way of showing them the power they can exert over difficult feelings. Drawn Onward is also useful for classroom discussions, and educators can find teaching notes on the publisher’s website.